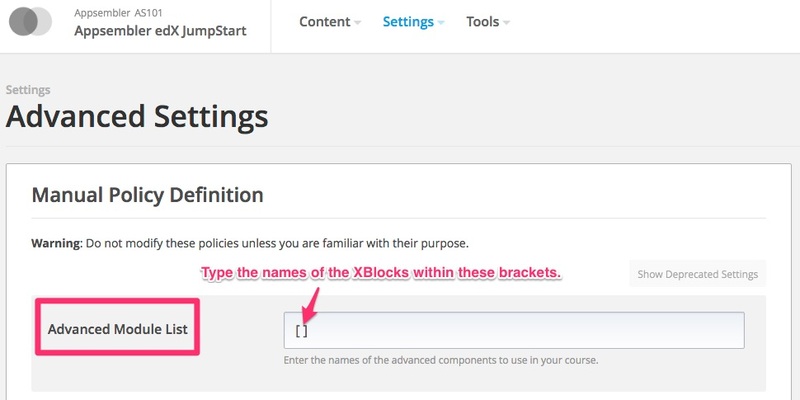 XBlocks are one of the important building blocks of Open edX. To learn more about what they can offer and how they work, check out this blog post and webinar we hosted a while back. Also, please review the XBlocks that are available on Tahoe and Enterprise. Working with XBlocks can sometimes be a bit confusing because you probably won't always have access to all of them (nor would you want this). It's important to keep in mind the difference between installing XBlocks and enabling them. Installing an XBlock happens on the back end, more technical, side of your Open edX installation. Installation of an XBlock needs to happen before that XBlock can enabled courses within your organization. If you're into that stuff and have experience working with Devstack, feel free to check out the official documentation that gives some tips on deploying XBlocks. Enabling an XBlock is something that requires little to no technical expertise whatsoever. That's what this article is going to cover. Let's jump right in! As mentioned in the previous point, this is something you'll likely need help with from someone with Devstack experience. If you're an Appsembler customer, just contact us and we'll be happy to work with you to get everything going. Once the XBlocks you want to use are installed, the rest is in your hands! This is found underneath the Settings drop down menu. Locate the section titled "Advanced Module List" (Hint: It's the first one) and type in the names of the XBlocks you wish to enable. 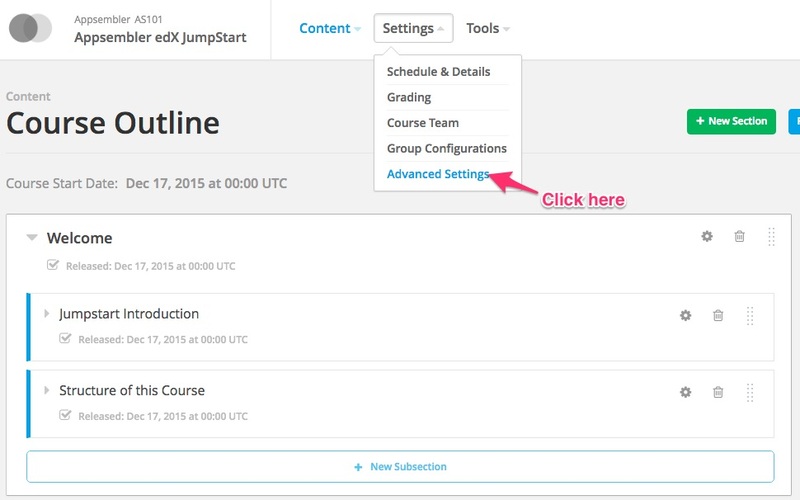 Each XBlock has a specific name attached to it that allows Open edX to recognize that it's active in the course. These names can often be found with a quick Google search for the XBlock, or the person who installed the XBlock on the server can usually tell you. Now navigate to a unit and try adding an Advanced component to see if it worked. 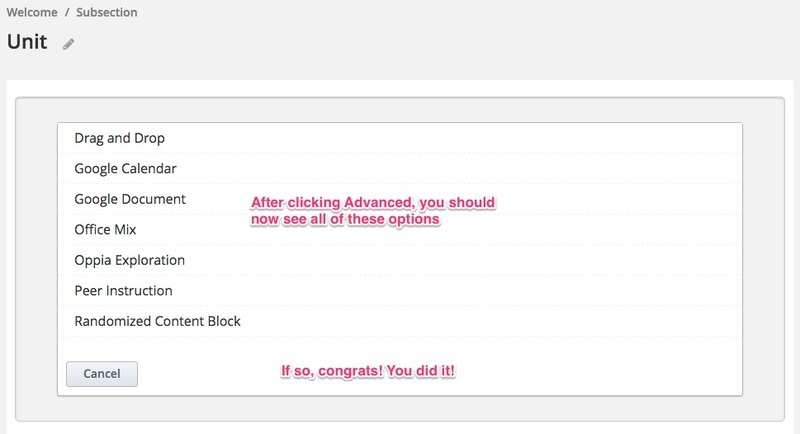 You should see the option for an "Advanced" module, and when you click on it, you should now see all the available XBlocks that you have installed. 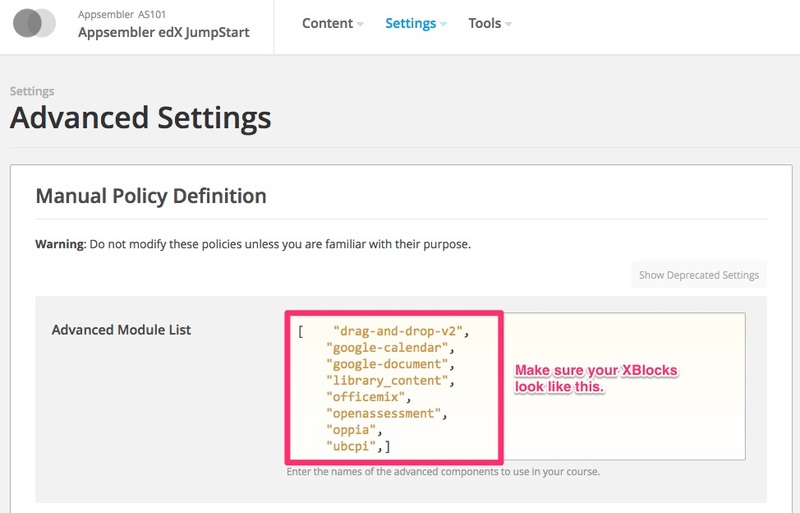 Although XBlocks are installed on the server/organizational level, they must be enabled for each course. If you plan on having lots of courses that all require similar XBlocks, enabling them over and over again can become tedious. We recommend having some sort of shared document, such as a Google Doc, amongst all course creators at your organization that simply contains a pre-formatted list of the XBlocks you plan to use in multiple courses. That way, course creators can simply copy the list and paste it into the advanced module list, which should save a lot of time.